To hear (Cayes) talk about this problem may be shocking to people who have never thought about what it’s like to engage in a simple activity like public restroom use. LGBT UNITED, a social impact feature documentary written, hosted, directed and produced by CSUN psychology professor and filmmaker Dr. Luciana Lagana, will screen in Santa Monica on Monday, November 14th, 2016 as part of the Official Selections of the 3rd Street LGBTQO Film Festival. 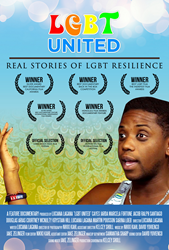 You can purchase LGBT UNITED tickets directly at the Laemmle Monica Film Center or online at https://www.eventbrite.com/e/lgbt-united-presented-by-dr-luciana-lagana-tickets-28810678515?utm-medium=discovery&utm-campaign=social&utm-content=attendeeshare&aff=esfb&utm-source=fb&utm-term=listing. (from the festival’s website) We are Santa Monica's first and only LGBTQO Film Festival. This year's event will hold its screenings at the Monica Film Center in the city of Santa Monica. In addition to film screenings, we are expecting to invite LGBT rights activist, LGBT Community Centers and LGBT artists for seminars and open forums to discuss how to improve equality and better represent our community. We are not an exclusive festival as we invite all filmmakers and artists of all walks of life, religions and communities to participate with us this November. This movie covers the resilience of LGBTQ members in the face of so many obstacles. For instance, a transgender woman experiences many struggles in our society, some of which are not evident. To use just one of these difficult circumstances as an example, Cayes Jarda, the female-to-male transgender star of the movie, was brave and direct in his description of the problems that he encounters when needing to use a public bathroom. “I saw audience members crying at prior screenings of LGBT UNITED when Cayes described how it feels to have his female intimate parts exposed and vulnerable when he must use the men’s public bathroom. He conveyed the fear, discomfort and sense of degradation that he experiences in these situations in a way that is very moving. To hear him talk about this problem may be shocking to people who have never thought about what it’s like to engage in a simple activity like public restroom use. This is a process that for most people is painless, but upon watching the movie, we learn not to take this sense of ease for granted,” concluded Dr. Luciana.